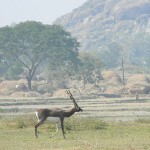 Places to see in Vetnai: Vetnai is known for its 1600 Black Bucks, which roam freely on an area of 40 sq. km. Near the sanctuary is the undulated landscape of the bluish mounds, which is a beautiful sight you must enjoy. Nearby attractions in Vetnai: Chilka Lake is a popular tourist destination that every traveler visiting Vetnai generally goes to see. Another spot is Monglajori Bird Sanctuary, where you can view Whistling-duck, Asian Openbill, Purple Swamphen, Grey-headed Lapwing and Cotton Pygmy-goose and numerous other local and migratory birds. Things to do in Bhetnai: The major thing to be done in Bhetnai is sightseeing and watching the Black bucks playing around in open valleys and grasslands. You can also visit the nearby Monglajori Bird Sanctuary to view rare birds some beautiful butterflies. A trip to the Chilka Lake, to enjoy its serene beauty and playful dolphins can also be on your cards. Watch it all yourself as well as capture every moment in your camera. You can also try the popular Oriya sweet ‘Chana Poda,’ which is baked yogurt. How to reach Bhetnai: Bhetnai can be reached from both Berhampore, which is 50 km and from Balugaon, which is 75 km from the destination. However, you should choose the route through Balugaon if you want to visit Monglajori first and then Bhetnai. However, if you travel by rail, then you have to come via Berhampore that has a railway station. From Berhampore there are regular bus services that can take you to Aska as well as Bhetnai. Best time to visit Bhetnai: The ideal time to visit Bhetnai is during the winter season. Lodging and dining facilities at Vetnai: Although Vetnai doesn’t have accommodation facilities for its tourists, good hotels are available in Balugaon. Even many comfort and budget hotels are available in the nearby town of Berhampore. Dining facilities come attached with the hotels of Balugaon and Berhampore. We went to this place on 25/12/11, from Balugaon. The route was not so easy to get, even with constant contact with Mr. N.K.Bhujabal. No local person on the road seem to have heard of it. The best location should be called Aska sugar factory. If needed, I can provide a map. but you can also see it in Google Maps. Watching the wild black bucks were highly exciting though and was worth the trouble to us. The total distance is more than 600kM, at least from our house in North Kolkata.